The setting: Quinta do Casal do Paço, a sixteenth-century manor house in the Lima sub-region of Vinho Verde. The house’s high stone patio. A table set for lunch. The landscape: The tumbled fields and fens of Northern Portugal. Overhead an azure sky, scuttling clouds, sunlight. The farmscape: Vineyard, hen yard, gardens. Bees and other winged creatures, busy with delight. Away, for now, the wild horses and sheep. Water, water everywhere. The soundscape: Rooster crowing, chickens (excited), church bells, twittering birds, the susurration of the wind. The farmer: Vasco Croft. Also: philosopher, architect, educator, winemaker. Host. “This is my perfect dining room: Vines in the sky,” he said, waving his slender fingers overhead. He had stretched a gauzy sheet into the twisted rigging above our table, scant hope against Portugal’s midday sun. Croft is tall and lanky, topped by a shock of silver hair. When he speaks he animates the air with his hands, knuckles like knotted cord. But it was grand by local standards, a granite manor house with a chapel on fully twenty hectares. Many here lived on less, deriving all of their nourishment from their smallholdings and venturing little into town. They ringed their vegetable plots with pergolas for grapes to clamber up: Something to eat, and something to drink. Croft went on to study philosophy, then became an architect and furniture designer in Lisbon. After his children were born, he took a deep dive into Waldorf education and Anthroposophy, the work of Rudolf Steiner, who also founded biodynamic agriculture. Croft became a Waldorf teacher-trainer. Meanwhile, the family farm had begun to crumble. By the early 2000s only a single caretaker remained at the manse, too little to sustain the effort. So Vasco Croft pivoted again, using his architectural mind to renovate the residence, barns, and outbuildings, and using his philosophical mind to renovate the vision. Left: The approach to Quinta do Casal do Paço. Right: The chapel. In 2004, he began replanting the vineyards, working with a biodynamic consultant to bring them back to life. That same year he launched the Aphros label, making wines, white and red, from the estate’s native Portuguese grapes. Later, he acquired an adjacent quinta, planting it, too, according to biodynamic principles. 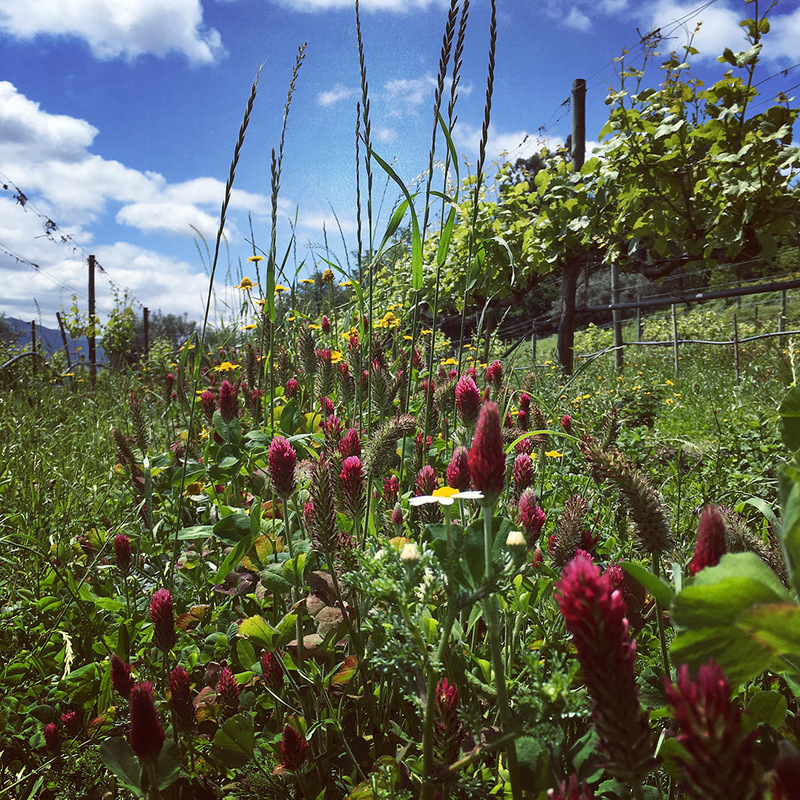 Today, cover cropping, herbal preparations, and mixed polyculture imbue these vineyards with a rangy vitality. Bees, wild mountain horses, and sheep animate the terrain. 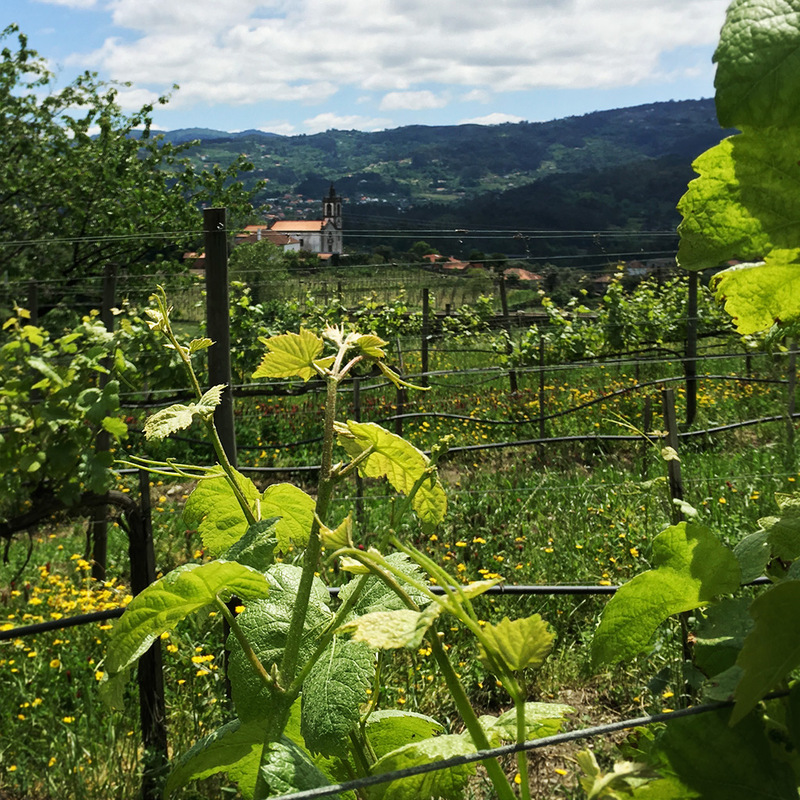 The newer site has a modern winery, but here at Casal do Paço, the winery is a dark, shallow cavern beneath the house, and operations are non-electric, entirely manual. Red grapes are foot-tread in a traditional Portuguese granite lagare. Pumps are worked by hand, very old-fangled. 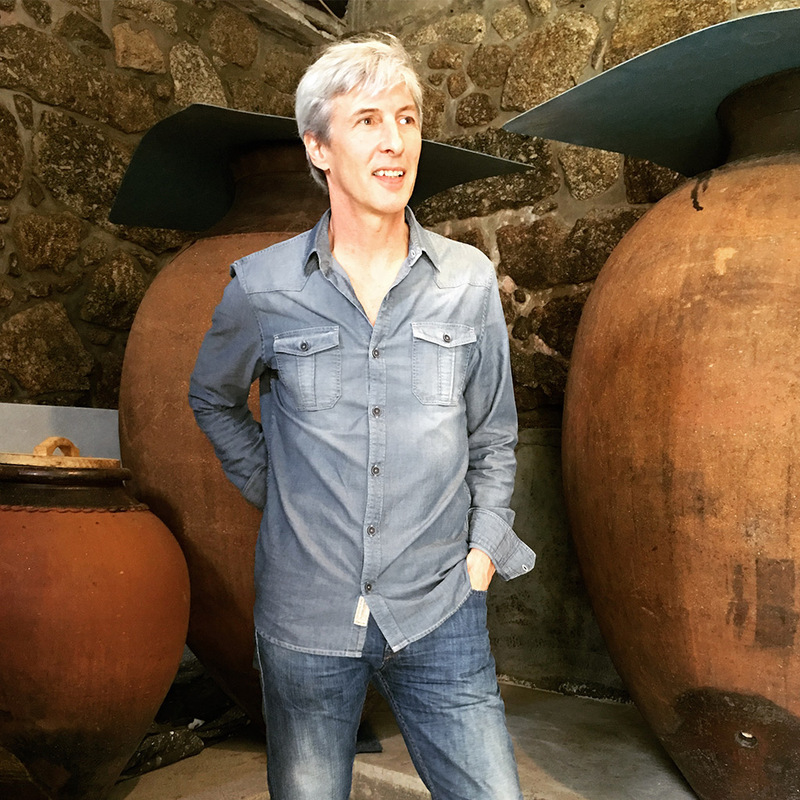 Some wines are aged in amphora. Medieval, still. Left: The winery entrance. 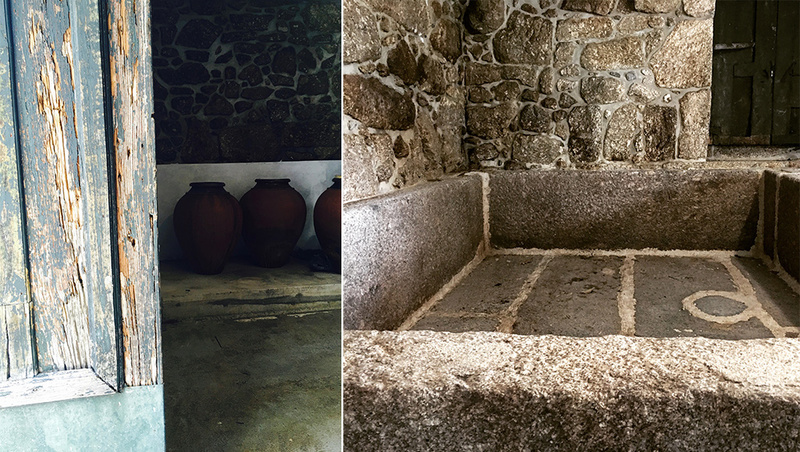 Right: Granite lagare for foot-treading red Vinhão grapes. 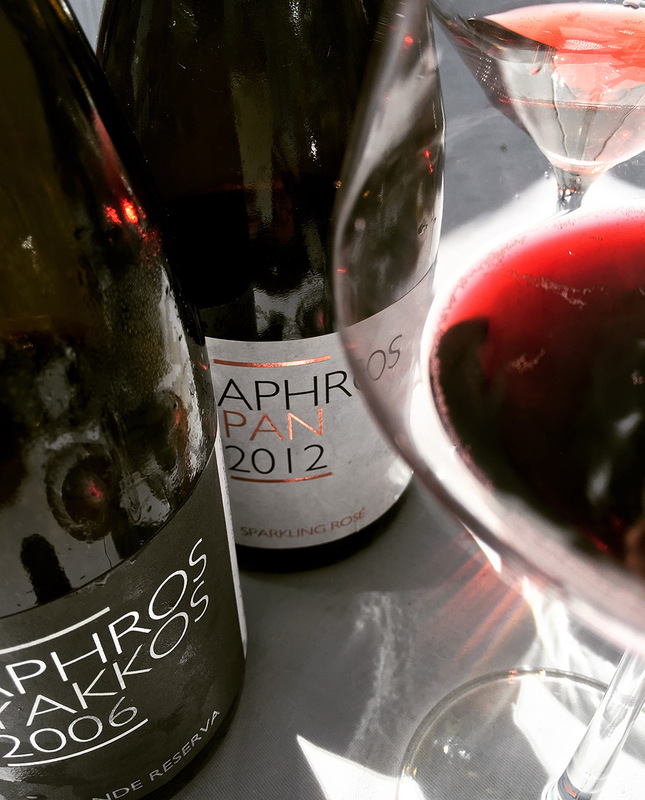 Aphros’s production of seventy-thousand bottles per year includes both still and sparkling wines, including a pétillant-naturel style, un-disgorged. White Louriero and bloody-red Vinhão are the anchor grapes; soon he’ll add some red Alvarelhão (also called Brancelho). As we ate lunch we tasted his wines. And we talked. Reflecting later on the conversation, and reading the transcript, I decided run it more or less in its entirety. I wanted to give readers a sense of Croft’s unfiltered voice (his English is clear and nuanced). 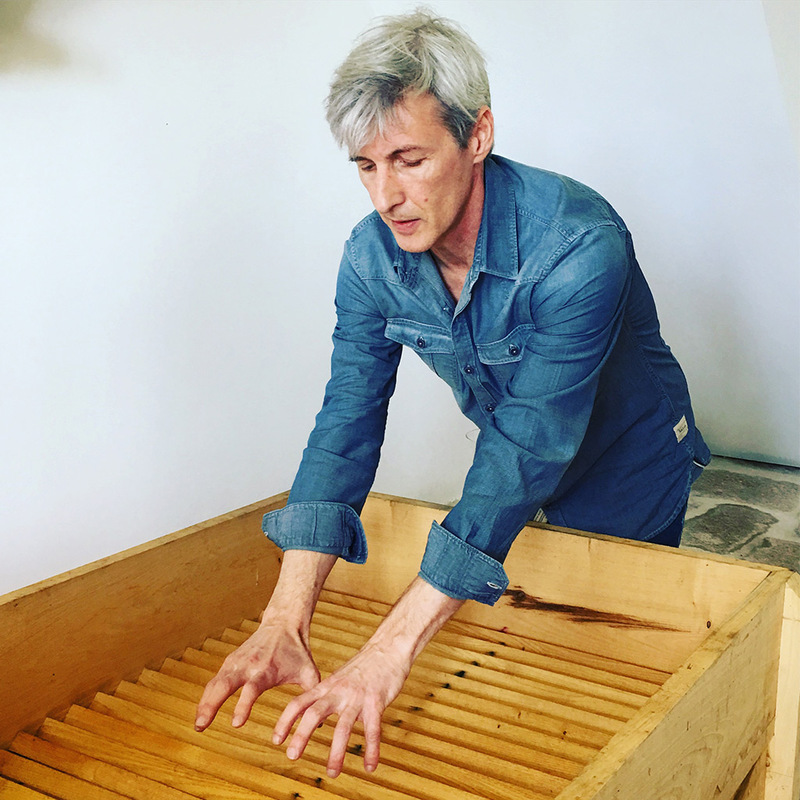 And because he is, at base, a philosopher and humanist, I knew his ideas would interest other biodynamic winemakers, plus anyone curious about his soulful practices. 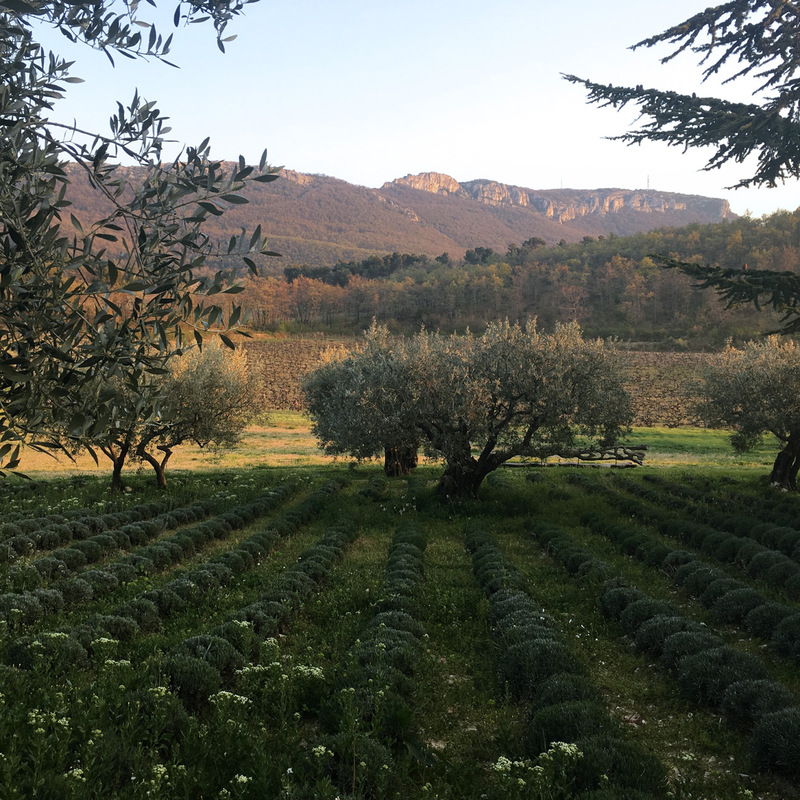 I have, though, condensed and edited the text and broken it into two parts: First, a Q. and A., nominally about winemaking but drifting into philosophy, technology, modernity, biodynamics, and the cosmic wheels powering Croft’s young project. Part Two (much shorter): just conversation. PART ONE: Q. & A.
Meg Houston Maker: What experiments are you doing right now? What is exciting to you in the winery or in your vineyard? Vasco Croft: Coming back to simplicity—do less, but more meaningful actions. Continue the trend of reductive methods and avoiding oxygen. Less technology. More focus on soil work, and this natural technology of oils and extracts. This idea of doing wines without electricity is very appealing because electricity has made a lot of damage. Technology just multiplies human lack of sense—it multiplies it endlessly. Before, there was no waste, no garbage. When you didn’t have this extraordinary power that makes work abstract, when you had to work to make everything, all houses were cleverly, sensibly done, according to nature, the planets, and the materials. It took effort and time and reason to do things—hand and heart. Where we ended up was with this lack of sense of how to work in the right way with our own energies, with our minds. Manifestation, existence. For anything to exist, you need polarity. All existence is day and night, sun and moon, high and low, male and female. I always found it was important to play with it like two genders. And the grape is especially connected, central to human being. It’s not by chance—it is sacred. It has also this polarity of old and new, of mature and young. [Holds up wine bottle.] This is what we have here, in sparkling form, with the Vinhão grape. Vasco Croft demonstrating his manual de-stemmer. His winery at Quinta do Casal do Paço is non-electric. MHM: You’re a modernist. You’re an architect with a highly refined twenty-first century aesthetic. And yet your aesthetic is also informed by tradition and ancient methods. Can you talk about how you balance these aesthetics? The old, the traditional, the moss-covered granite, with the new, the streamlined, the rectilinear? VC: The rectilinear has always existed. We can go back to Egypt and the forms of the temples and pyramids to pure geometry. The square and the cube are natural, God-given geometry. And we are basically cubes, functionally, because we have front and back, left and right, high and low, up and down. We are molded into the three dimensions. MHM: How do you decide what technology to keep and what technology to leave behind? How do you balance the idea of having a house that has some electricity and having a winery that has no electricity? Having some mechanization in your vineyard and having no mechanization in parts of your process? How do you make that decision? What does that hinge upon? VC: We all have to deal with this through becoming conscious what is of service and what is not of service. Technology has made us disconnected, and we have to make a conscious effort to connect. Every single one of us. MHM: A conscious effort to connect to what? VC: Well, you have inherited the most sophisticated mechanism that exists in the universe: your body, your life system, as microcosm. There is the plant world, the mineral world, the animal world—and you have the spiritual world inside yourself. A plant does not have the gift of consciousness. It has a God-given perfection. 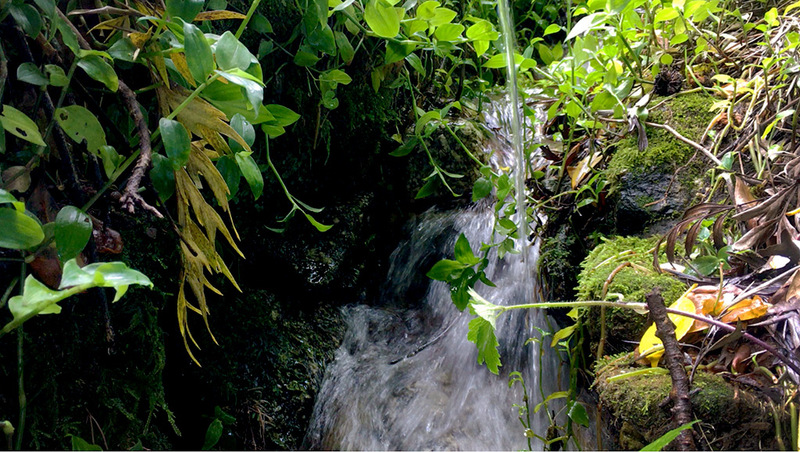 Water is everywhere at Quinta do Casal do Paço, in streams, fountains, and a biodynamic flow-form. MHM: Anthroposophy does not believe that plants have consciousness. VC: No, they do not have consciousness. They are expression of higher consciousness. In that sense, the lower you go, the highest spiritual realities are connected with the mineral: substance and purity. Then you have the animals. Animals also don’t fail. Animals don’t sing. Animals don’t do anything that is against nature. Then you have human beings, and in the human being you have a body and consciousness together. We can create, and we can make mistakes. MHM: And don’t we make a lot of them! So, Steiner believed in the Aristotelian ideal of the ladder of consciousness [scala naturae], with Man at the top and soil at the bottom? Is that true? VC: It’s not really what I’m saying. Some people say Steiner was the reincarnation of Aristotle. But Steiner fancied himself aligned with the Goethean worldview: That this is a whole symphony, and that human consciousness is made out of universal consciousness. We are spiritual, we are not bodily. Our body is an instrument through which we contact with manifest reality. Steiner was the leader of the Theosophical movement, which was totally influenced by oriental, or Eastern, mysticism. Steiner said, Okay, all that is true, and while it was captured in different formulations, the world of the spirit is the same. The way it’s reflected into cultural expression, texts, and ideas, varies with the evolution of consciousness. So whereas in the East they have preserved this very powerful attitude toward life and an understanding of the spirit, we [in the West] went toward materialism, and also the development of the intellect to understand the material. We lost the sense of the spiritual. Loureiro vineyard with a view toward the town chapel. That process of scientific thinking that we have made in the West—Steiner says: No. Yet we must not go back to the Eastern, we must now go through into an area where scientific understanding applies to more than what is physically visible. And, we cannot understand ourselves and nature by just looking at the physical—the physical does not explain itself. You take a human being, the human body—left to its own, just the physical side—it’s a corpse. A corpse is made of minerals. And once life has gone out of you and is not animating you, it’s just minerals: calcium, potassium. There is a life that informs all living, breathing bodies, and it’s a different realm, which Steiner calls the Life System or the Etheric. It’s connected with the four elements. It’s connected with earth—the mineral part. It’s connected with water. Then, for sensation and feeling, there is a sensitive system—which we have together with the animals—which he calls the Astral. And then we have spirit. Spirit is beyond, it’s pure consciousness. Not just sensation and feeling. It’s beyond life, beyond body. So, when Steiner speaks of a farm, a biodynamic farm, he speaks of self-sufficient organisms, where soil, plant life, animal life, human beings, are in balance. The mechanism of the farm does not work without, first of all, the sun—the light source—the informative influences of the sun, moon, and the other planets. So, you take certain actions to affect the life system, but using the rhythms and the formative influences of the Big Machine. Cover crops between rows of Loureiro. MHM: A minute ago you said that scientific understanding applies to more than just what is physical. How does scientific understanding reach to the spirit and the level of sensation and pure consciousness? VC: First of all, you have to study yourself. Anthroposophy is a meditative science. You have to know the nowhere. MHM: How do you get toward that? How do you yourself reach toward that in your own practice? VC: There are no lack of resources for learning. There are exercises, conversations with people, life itself, the challenges of life, do help. One thing that’s central is that you have to know yourself without the mirror of experience. When you were a baby you were super intuitive and spiritual. You had no prejudice, no psychological problems. We are born with a sense of infinite joy and infinite intuition to learn. Then, through language, we learned to structure the world and capture the concepts that the speaking world around us transmits. The small child does not refer to himself as a body, in the first months, but there’s a moment where you identify with the body. And you say “I.” You start referring to yourself. MHM: Is what drew you to architecture the same impetus that drew you to Steiner’s philosophy? How are those impetuses different and how are they the same? VC: One has nothing to do with the other. It’s like you’re asking, Oh, you had this girlfriend, you were attracted to this girlfriend—What does that have to do with architecture? I became interested in Steiner because I was adolescent and I was kind of in awe. I knew I did not know how to explain to myself my existence, so I was reading everything. I stopped with Steiner because it seemed to be the most complete, and it could make incursions into all areas of life—also practical. MHM: What was architecture not doing for you? What was missing? VC: Architecture is not philosophy. Not at all. If you are an architect, or if you are an engineer, or if you are a pharmacist, your existential questions still remain. They are not solved because you know how to do something. Sparkling red Yakkos and sparkling rosé Pan, both made from Vinhão grapes. MHM: Did you have an epiphany? I mean, it’s not like one day you’re an engineer and another day you’re a philosopher. Was there a continuum of personality that draws you to one and then makes you feel you need to move to the other? VC: We like to label things for the comfort of our minds. In reality you are not American, you are not female. All this you can get rid of, and still you are you. MHM: So, there was something in you that drew you to architecture, and there was something later, that was consistent, that drew you toward something different. Am I understanding correctly? VC: For me, wine, agriculture, education—all are part of a path and life rhythm. What one feels inclined to experience at certain moments, for some people it’s very stable. Mozart, at three years old, was making great music—until the end of his life. In my case, it has not been like this. From age 22 to 33 I was married. Marriage, family, children. All that had made perfect sense. But from then on, I prefer not to be married. It’s not like something you previously decided, with your mind. I don’t know if I’m going to do agriculture and wines for the rest of my life. I don’t know. MHM: If Steiner were sitting with us here today, what would you say to him, if he asked you about your winemaking practice and what you have learned from his teachings? VC: If Steiner were here today I would like to enjoy having a glass of wine with him, you know? And kind of hug him, and say thanks! NEXT, the conversation continues, mostly about the translation of substance into essence. Meg, this is a great read! Awesome pictures, too, of course. This guy sounds absolutely fascinating. You must’ve had a blast during this trip/interview. Vinho Verde is on my list, and this really brings me there mentally. Cheers! Isaac, thanks so much for reading, and I’m glad you found good substance, here. Meeting with Vasco Croft was certainly a highlight of the trip. Truly beautiful stuff here. I’m sympathetic to Vasco’s instincts & moved by his impressions. Stunning insights on technology, (), our inheritance of the human body, seeing ourselves as a mirror of manifest reality…. Vasco has a particular way with words. Thanks for sharing this with us & I look forward to part 2. Well done, Meg. Thank you so much for reading. You are fortunate indeed to enjoy the pleasure of friendship from such an engaging man.